So you just moved to SQL 2012, excellent news! The very next day, someone is running an ad hoc query and copy/paste from the results grid is adding rows when they paste into Excel! The data hasn’t changed, so what is the cause? The answer is most likely that your data has carriage returns in it, and you just didn’t notice before. There is a behavioral difference in SQL Server 2012 that when you copy data from the grid and paste into Excel, the carriage returns are taken into account and data is split into new rows. In previous versions of SQL Server, the carriage returns are not copied as such. The problem appears to stem from moving SSMS into the Visual Studio shell, which took place in SQL Server 2012. When you copy these results from SSMS in SQL 2008, and paste into Excel 2010 or Excel 2013, you will see 2 rows. However, if you do the same using SQL 2012, you will have 6 rows. As you can see, the data has been split by the carriage returns. The great news here is that your data is actually cleaner than it was in SQL 2008. 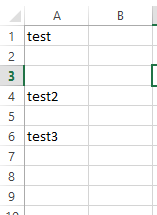 Notice that the extra spaces between “test2” and “test3” are now removed. The carriage returns in SQL 2008 displayed as blank spaces, thus the quality of your data was impacted by these even if they did not split your data. Remember, this was only cleansing for a single character that you did not want. At the very least if you are experiencing this, you should probably check for a line feed next (char(10)) and replace that as well. You could also make a general purpose UDF for stripping out all low ascii characters. This brings us to our next point – Data Quality. Now that you have your workaround, the next step is to get a project together to clean up your old data, and also to clean your data inputs. Other options here involve some analysis around the process you are using. Should you be running a query and copying the data into Excel? In some cases, other options may be available. For example, this issue does not exist when you load data into PowerPivot. Perhaps a Business Intelligence Semantic Model or PowerPivot Model would be a better solution moving forward. Finally, feel free to vote up the suggestion on Connect related to this topic. Having too many rows is a much larger deal for most users than some extra whitespace, thus the manner in which this was handled prior to SQL 2012 seems to be the desired output.